It's hard to imagine the Jeep Wrangler Rubicon could be made more capable, since it is already the most capable vehicle in the world…but Jeep has done it, reinventing the off-roading legend and making it even more functional than ever before. With enhanced and increased 4×4 capability and what Mike Manley, Head of Jeep Brand – FCA Global calls "an array of beefed-up off-road components…Rubicon Recon is the perfect Wrangler for our most loyal, diehard off-road enthusiasts," the new 2017 Jeep Wrangler Rubicon Recon is officially the most capable Jeep on the road. Tackling even the toughest terrain will seem like a piece of cake with special components such as a front axle featuring strengthened tubes and reinforced end forgings, enhanced off-road rock rails shortened to accommodate up to 35-inch tires, and a half-inch lift. Other exciting features include Low Gloss Granite Crystal-painted aluminum wheels, a steel front bumper with a winch-capable design, and a host of "Rubicon" branded features on the upgraded interior including heated leather seats. There's so much more to see, so you really have to visit us at Astorg Auto in Parkersburg, WV to find out more, and take a test drive in one of our new 2017 Jeep Wrangler models today. 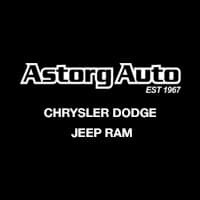 Astorg Chrysler Dodge Jeep Ram FIAT	39.265638, -81.5359241.